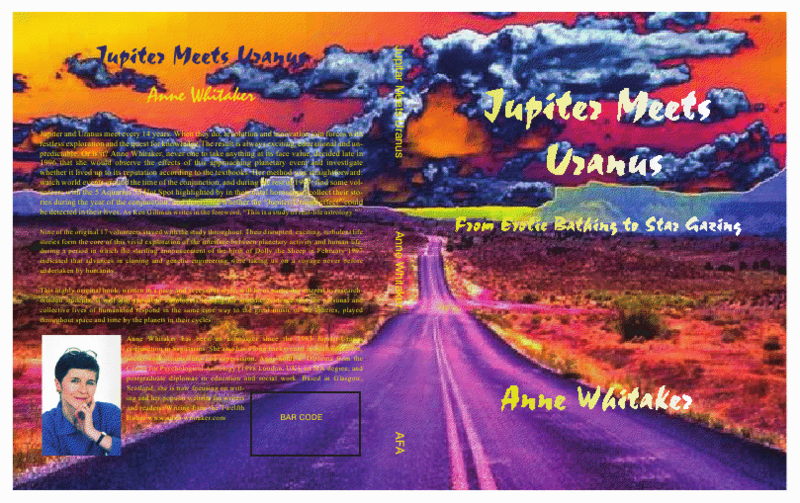 This interview was done as a promotion for my 2009 book “Jupiter meets Uranus” by Wendy, of the excellent The Know It All Astrologer blog. I thought it might be fun to run it here on this brand new site, just as a test piece! They all do, especially the long-lasting ones. The deep challenges that force our growth lurk in the realms of the unconscious, just waiting to hitch a ride on the nearest really tough transit. For example, I didn’t think that ten years of Neptune transits was going to involve an enforced descent into the Underworld for most of that period! However, the good news is that I have now emerged, much improved (unless you ask my husband….!) with enough notes to keep me writing for a further ten years. What is your funniest transit or retrograde experience? There are several, not all of which can be aired publicly! The one which comes immediately to mind is the occasion, in March 1985, when Saturn turned retrograde on my 28 Scorpio IC. In the middle of lunch with an old friend who at that time was a bank manager, without warning, I passed out. Just then, a friend of his, who was also a bank manager, was passing by the restaurant window. I came round and insisted on going home – very groggily, with a bank manager holding me up by each arm. Very Saturn in Scorpio, don’t you think?! Would you rather be ruled by Uranus or Jupiter? Why? What a question! Both those planets are strong in my horoscope, Uranus in the tenth house leading an eastern bowl shape, with Jupiter in the third closing the bowl, and the two in bi-quintile aspect. My Ascendant is also on the Jupiter/Uranus midpoint. However, if forced to choose I would go for Jupiter, provided the aspects weren’t too difficult. My reasons are probably dictated by the stage I’ve got to in life: that disruptive, eccentric, unpredictable, stubborn individualism characteristic of a Uranus-ruled life feels too tiring to contemplate now! Jupiter’s boundless energy and optimism, ability to inspire others and be inspired by the more positive dimensions of life, and willingness to be open to a sense of meaningful connectedness to that which is greater than oneself, are especially attractive to me at this point. One, there are dozens of ways of evading personal responsibility – resolve at the outset never to do so by blaming your horoscope or your transits for your difficulties in life. Two, realise that objectivity is something to be aspired to, which can never be achieved by mere human beings. This being the case, try to recognise that you can be most objective and therefore most helpful by reading the horoscopes of strangers, provided you have appropriate training and supervision. When approaching your own horoscope, or those of your loved ones, you will inevitably colour the planetary picture before you with your own hopes and fears. Three, the illuminating light which is gradually cast as your understanding of the symbols in your chart grows, will be wonderfully helpful in shedding light on your gifts, pains, motivations and aspirations. But bear in mind that possessing astrological knowledge has a shadow side – for example, I have never known anyone including myself who didn’t look at upcoming transits, especially of Saturn and Pluto, without a certain amount of fear. To help my astrology students with this, I used to point out that 99.9% of the human race from the beginning of time has managed to stagger through life without the aid of astrology! So – enjoy the fascination of deciphering the astrological map of your life. But don’t get too precious about it – and be aware that this wonderful knowledge has a double edge…. The two astrologers who have most inspired and educated me have been Liz Greene and the late Charles Harvey, with both of whom I was fortunate to study – unofficially from the mid-1980s and formally between 1995 and 1998. As reference books for my interest in mundane astrology, my three favourites are: The outer planets and their Cycles by Liz Greene, Anima Mundi – the astrology of the individual and the collective by Charles Harvey, and Mundane Astrology by Michael Baigent, Nicholas Campion and Charles Harvey. My copy of Stephen Arroyo’s Astrology, Karma and Transformation , that wonderful in-depth companion on the ‘stormy journey of the soul’ is now so well-thumbed that it is starting to fall to bits – and when I feel like some outrageous, light-hearted, funny, but deadly accurate astrological analysis I turn to Debbi Kempton-Smith’s Secrets from a stargazer’s notebook. Anne Whitaker has been an astrologer since the 1983 Jupiter-Uranus conjunction in Sagittarius. She also has a long background in adult education, social work, counselling and supervision. Anne holds the Diploma from the Centre for Psychological Astrology where she studied with Liz Greene and Charles Harvey (1995-98 London, UK), an MA degree, and postgraduate diplomas in education and social work. Based in Glasgow in Scotland, she is now focusing on writing, and on running her popular website for writers and readers : “Writing from the Twelfth House” which has just been included in the prestigious and prolific USA astrology blogger Jude Cowell’s Top 10 Astrology Blogs for 2009. Posted in 01. Very First Post!